We're delighted to support Temple Street Children's Hospital through our Corporate Social Responsibility programme. 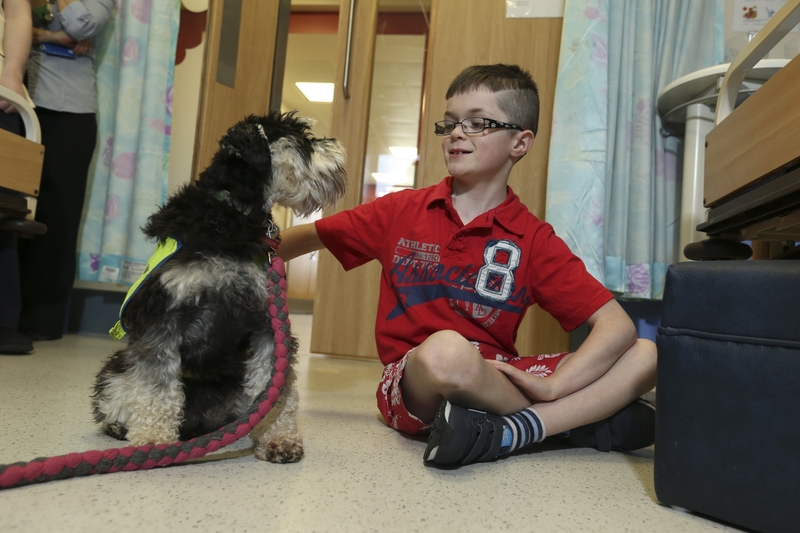 This is our third year of supporting the Temple Street Pet Therapy programme and it doesn’t get any less rewarding. The programme arranges for a very cute dog to come into the hospital once a week to visit the children and take their minds off their illness. Many long-term patients, in particular, eagerly look forward to every Thursday morning when one of the specially trained dogs comes around the wards. I’m a dog lover myself so it was a great treat to be invited into Temple Street recently to see miniature schnauzer Buster in action. Buster’s equally cute sister, Schuey was also there so there was an extra amount of excitement on the day. Both dogs were so gentle and it was very touching to see the children’s faces light up when they came around to say hello. The canine siblings also provided some light relief for some of the worried-looking parents on the wards at the time. We’re delighted to support such a positive initiative and a big thanks to Peata for supplying such brilliant dogs. If you’d like to read more about a day in the life of a pet therapy dog, click here for a lovely account of what Buttons the Yorkshire Terrier gets up to when she visits Temple Street. Hello. I live and breathe communications and love finding different and original ways to reach an audience. The challenge lies in trying to keep things fresh even when it’s a topic you’ve covered before. Branding, PR and communications are the three cornerstones of what I do so it’s a very interesting job!